MARLBOROUGH, Mass.—Xtalic Corporation, a developer of nano-scale metal alloys and coatings aimed at solving customers’ mission-critical materials problems, has entered the electric vehicle market with products that are reported to extend the life of connectors in electric battery chargers by up to 40 times. Xtalic has applied its XTRONIC® and LUNA® nanostructured alloys to lengthen the service life of electric vehicle charger connectors. 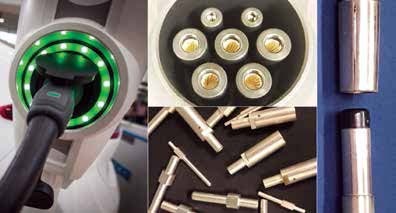 Traditional connector contacts employ a silver-over-nickel-over-copper construction that wears through after 250 charge cycles. Xtalic replaces these layers with its materials to significantly enhance the connectors’ hardness, durability, and corrosion resistance. The Xtalic alloys have achieved up to 10,000 charge cycles in high normal force applications, the company said. Xtalic products are said to operate at 150° C or higher — temperatures that may cause conventional materials to lose critical properties required for safe operation. All Xtalic materials are reported to be stable at high temperatures due to a carefully engineered crystal structure. Xtalic said that connector companies and OEMs are currently testing and qualifying its materials, and the company expects to see them incorporated in the next generation of electric vehicles. Xtalic is also developing XTALIUM™, a nanostructured aluminum alloy, to help improve range and performance in the electric vehicle market. Xtalium is described as a durable, corrosion-resistant coating that enables the use of low-cost, lightweight magnesium alloy for automotive components. The magnesium parts weigh less than aluminum, and when coated with Xtalium alloy, they have substantial corrosion protection. Xtalium is also said to increase the corrosion resistance and performance of rare earth magnets.